Unleash the power of your mind with the Grey Knights in Kill Team. These noble warriors of mankind don’t just have superior tech, armor and weapons, they also have one of the few things most of the other factions don’t: Psykers! 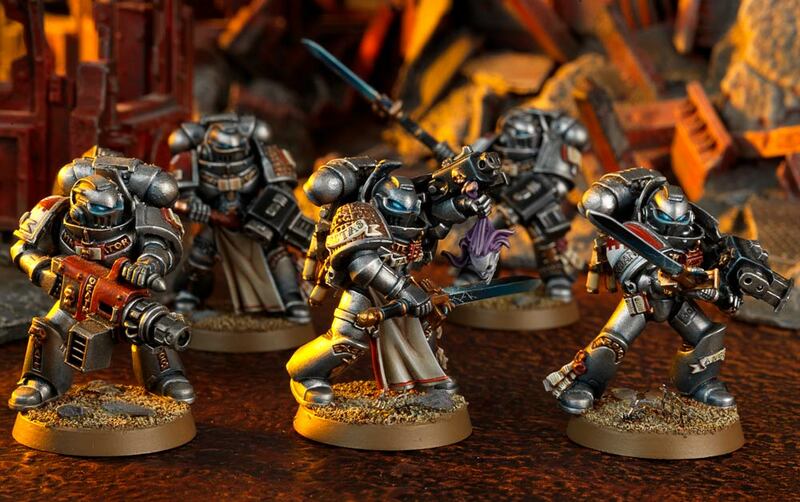 The Grey Knights are an elite fighting force that hunt down threats to the Imperium that would quite literally drive normal citizens insane. If you’ve got a Daemon infestation to fight, the Grey Knights are the ones who show-up. Today, we’re going to take a look at what these Marines bring to the table and what makes them such a frightening opponent in a Skirmish Scale game like Kill Team! One of the first things to note about the standard Grey Knight Kill Team is that they pack a serious amount of firepower in a very small package. Special Ranged weapons take down the toughest foes from afar, and if anything DOES get close, it’s time to flip the switch on those nemesis force weapons and do WORK. The second big advantage of the Grey Knights is that they are Psykers. They are ALL Psykers. In fact, in all of Kill Team (currently) only the Grey Knights and (spoilers) Thousand Sons have access to psykers. 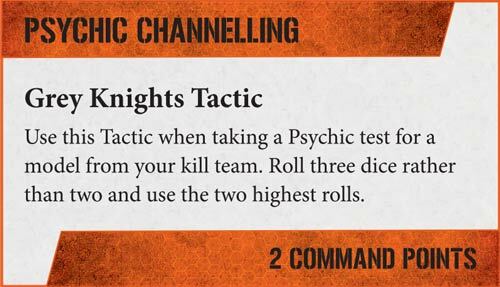 This gives them an advantage because that means most of the time they will have psychic dominance on the tabletop. For now, it’s a pretty limited pool. Currently in the psychic phase, Psybolt is the one power they can use. It’s basically Smite, but not as good…It only does 1 mortal wound, but if you get an 11+, it does more. It has a warp charge value of 5. You still have similar range, LoS and targeting restrictions as as Smite does in 40k. Regardless, this is still a big advantage. That’s basically a free model you can take out or cause a flesh wound to once per round. Each of the Grey Knights has access to it as well – so you just have to pick which Battle Brother is going to use it to get the maximum benefit. Really, there is just the One option – A Grey Knight. While that might seem like a pretty limited unit pool (being 1 option) keep in mind that the Grey Knight armory is impressive. A stock GK comes with a storm bolter and nemesis force sword. But you’ll be able to sprinkle in psilencers, psycannons, incinerators, and the truly frightening Daemon Hammer. Psychic Channelling is 2 command points and it’s going to make your psychic phase even more dominate. Getting to roll 3 dice and use the two highest results on a test is pretty great. Again, if you’re just using this to ensure Psybolt goes off I think those command points could be better spent…but if it’s the final wound on a model, why not? 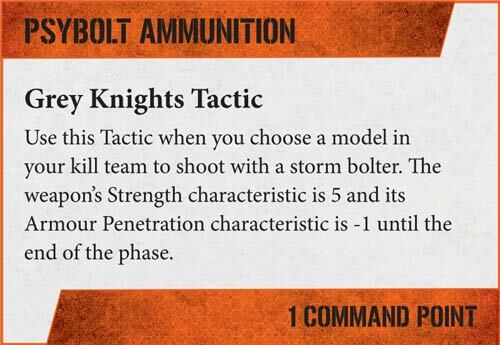 Just like in 40k, the Grey Knights have a Psybolt Ammo option. This bumps the strength to 5 and adds -1 to the AP. It’s great for when you need to drop the boom on a target. If you want to start a Grey Knight Kill Team, just grab a Strike Squad box and you’re off to the races – you’ll probably have more bodies than you’ll need and bits to spare, but hey, you could eventually expand your list too.